We started by cleaning the exterior of the fridge with Windex. Once we did a light sanding on the exterior (including the doors), we wiped it down again with water to get the dust off. We taped off the back section and front so it wouldn’t get paint on the inside of the refrigerator and proceeded to paint the sides and top black. 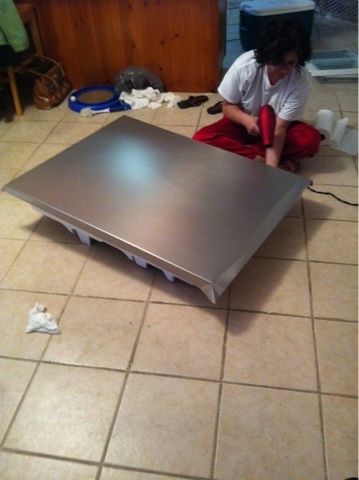 We used Rustoleum appliance epoxy. While the sides and top were drying we decided to put the faux stainless steel film on the doors. This was the most time consuming part of the project. 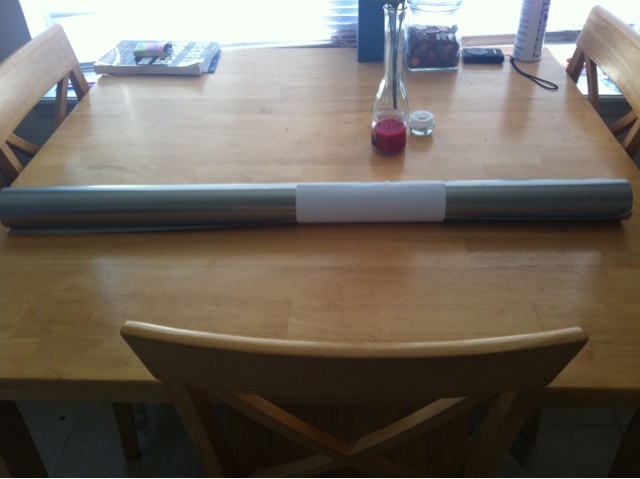 The film comes in different sized rolls, I think ours was 6 ft X 36″ and it worked well for what we needed. Before we started applying the faux stainless steel, we wiped the doors down with vinegar to make sure their wasn’t any residue from the Windex left. The Windex can ruin the application of the faux stainless steel. There are 2 methods you can use to apply this film. One method being a dry application, where you just try to put it on and smooth it out. There is also wet method where you wet the surface with soapy water. We figured we would just go with the dry method, which was a mistake. We had to keep pulling it off and there were bubbles and stuff kept getting underneath making it look awful. Finally we decided to take it off and try the wet method. It was SOOO much easier it made me question why they even suggest the dry method. Once we got the soapy water on the surface we peeled the backing off of the film and stuck it to the door. We used a credit card and a squeegee to get out any bubbles. If you decide to leave the paper on the back and pull off a little at a time as you smooth out the surface, make sure the back of the paper is clean of any dirt or debris. After pulling the film up repeatedly to get out tiny pieces of dirt and what not, we finally figured out it was because the paper on the back of the film was dirty, even though we were going to peel it off it was still touching the surface of the fridge we were about to be sticking the film to. I would definitely recommend using a hair dryer to heat up the film around the corners and edges. It really made a difference in the look and the application of the film. It pulled the film tight around the edges and corners. So the main thing I learned is to USE THE WET METHOD! And take your time and it will come out great. I think it came out really well! If you have any questions about anything we did or used, feel free to ask or leave a comment below! Here is a stop motion video we did working on the fridge outside. Hi! Just stumbled across your blog and this specific post. 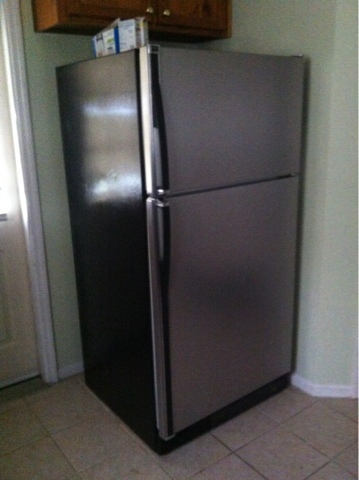 How did/has the refrigerator held up? The hubby and I are wanting to do this to the fridge in our rental unit so that it coordinates with the rest of the appliances in the event a new fridge isn’t in the budget. Would love to here your thoughts. It has held up amazingly! 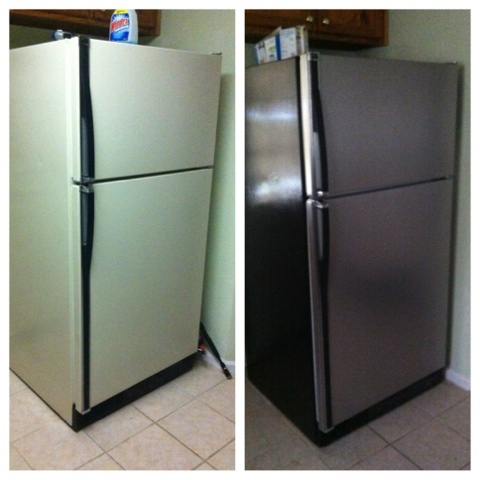 I just sold the fridge to someone for a rental unit actually, but the it looked the same as it did when I first put on the faux stainless steel stuff(almost 4 years ago). I would do it again for sure! What did you do with the gasket? Did you leave it white/tan color ? I left it as it was, which was white. Hi. Why do you have to sand it ? My present frig has a rough surface not smooth so this may not work anyhow. I am so tired of the white appliances but nothing is wrong with them ! 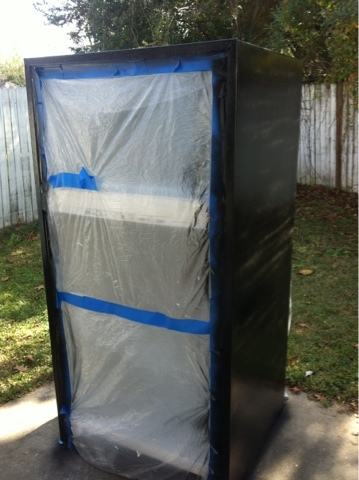 My fridge had a glossy surface, I only had to sand areas that we spray painted so it would stick better. That looks great!! 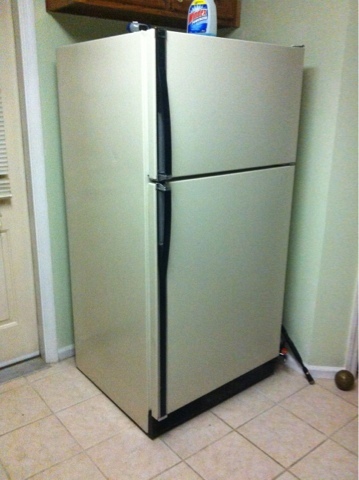 The original fridge, was it textured or smooth? Thank you! Thank you! It was textured, but it still looked great over it! I originally bought it from a website that is no longer in service, but I did find it on Amazon. I have a link to it in the post, if you want to click on faux stainless steel film under the items needed. But I believe it’s called EZ faux decor. Did you remove the handles before applying the film? If so, was that easy? I did! And yep it was pretty easy, labeling where the parts came from will help too when you piece it back together.